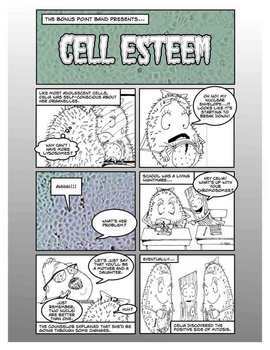 Add a little humor to your instruction with four great science comics by The Bonus Point Band. Each story was created to illustrate a particular science objective while demonstrating the plot organization of most narratives: introduction, rising action, climax, falling action, and conclusion. You can teach science, reading, and writing at the same time! in teams on the second one. partners taking turns per frame. Encourage them to use expression as they read. a story on a sheet of notebook paper. The final draft should be 5 paragraphs: Introduction, Rising Action, Climax, Falling Action, Resolution. - Laminate for Reading Centers. - Include in your newsletter. - Act out the stories. - Create sequels to the comics. - Use them as coloring sheets/posters. More comics are on the way. Follow us, and we'll let you know when we have something new. Just click "The Bonus Point Band" above. Then click "Follow Me." Science Comics: Book 1 by Ash Kizer is licensed under a Creative Commons Attribution-NonCommercial 3.0 Unported License.Permissions beyond the scope of this license may be available at www.thebonuspointband.com.